Sustainability is achieved through upcycling the raw materials contained in the end-of-life tyres (ELTs). This upcycled material can be used as a substitution for fossil-based resources and enables a holistical positive CO2 footprint. CO2 emissions from conventional industrial Carbon Black production amount to 35 million tons a year. 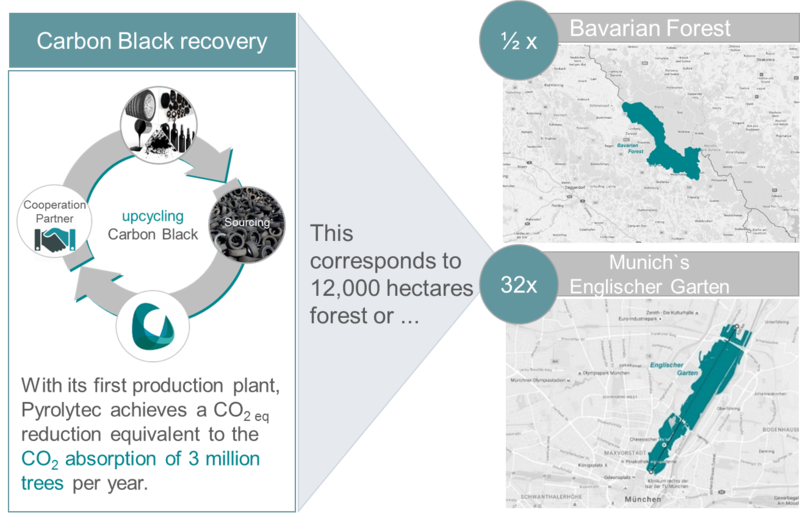 Pyrolytec can achieve a positive CO2 footprint and savings of 72,000 tons of CO2 equivalents a year through using the unique Carbon Black upcycling technology. This volume is equivalent to the annual CO2 absorption of 12,000 hectares of woodland, which is 32 times the size of Munich’s Englischer Garten. The 36 million litres of heavy fuel oil which conventional Carbon Black production uses every year will be substituted by Pyrolytec’s carbonization process. More than 70% of the energy requirements entailed by the process are covered by recycling gas as a byproduct in Pyrolytec’s own combined heat and power plant. Recovering valuable raw materials from 13 million tons of ELTs per year worldwide constitutes a market with huge untapped economic potential. Pyrolytec has set itself the goal of realising the recovery of this potential which has so far remained ecologically and sustainably unused. The tyre industry takes 70% of the entire conventional Carbon Black production which becomes available again as potential feedstock in the form of ELTs. This results in an annual ELT volume of 1.55 million tons p.a. in Central and Eastern Europe. This potential should not be left lying fallow, which is the reason why Pyrolytec has set its sights on becoming the largest producer of upcycled Carbon Black within the next five years. The manufacturing process entails carbonization as the basis of the production process during which pure intermediates are produced from ELT chips to a consistently high standard. In downstream production, the semi-finished product goes through the process of de-agglomeration, pelletization and drying to produce high-grade products for the respective application-specific areas. The production know-how developed over more than half a decade resides above all in the operation and handling of the formulations for the various products and applications. Moreover, byproducts such as oil and gas are recovered from the carbonization process. Gas as the source of energy is fed directly into the CHP and used by the processes as electrical and thermal energy. The low viscous oil with a high flashpoint contributes to profitability through its sale to the marine industry for example. The properties of upcycled Carbon products enable them to be sold in selected speciality markets of the Carbon industry which are set apart from the mass market of tyre production. 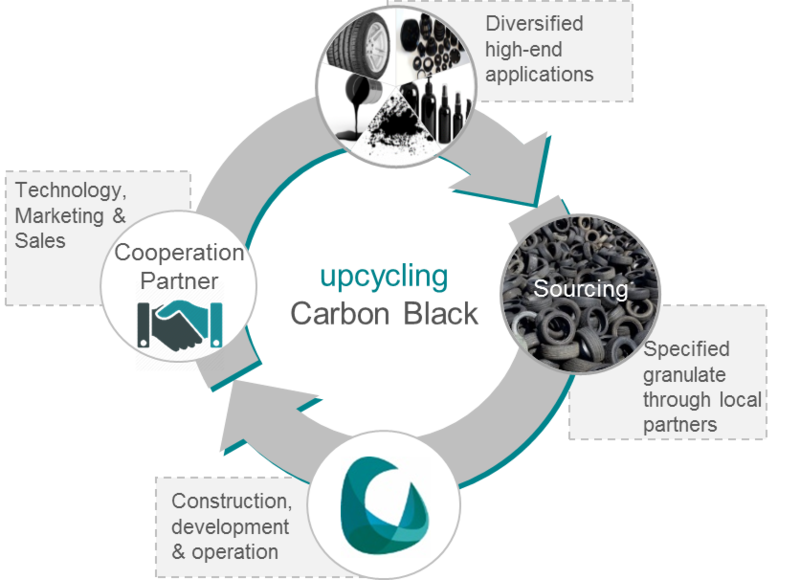 Owing to their unique selling position, upcycled Carbon Black products can be placed more competitively in these market segments and command higher margins than conventionally produced Carbon Blacks. Pyrolytec’s application-driven production of CB enables various product segments to be served with highest-grade CB quality. The first plants are designed for producing for the high-priced CB niche markets of plastics, paints and coatings. 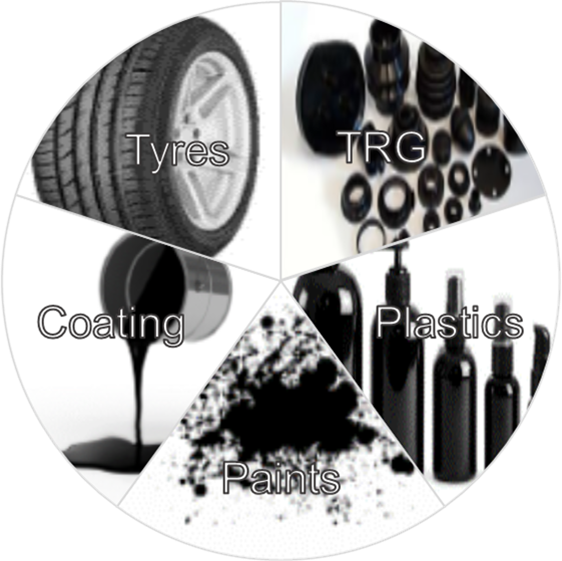 Further plants are to additionally serve the tyre and technical rubber goods (TRG) market which are almost ten times the size as soon as greater economies of scale have been achieved. The products’ most important USPs are their low PAH content, high tinting strength, excellent reinforcing properties, higher mechanical abrasion resistance, dynamic performance, as well as excellent weather and UV resistance. Chief Executive Officer, 1964, CEO and principal shareholder of Pyrolytec GmbH. Long standing experience in successful entrepreneurial activities with strong background in founding and development of start-up corporations. 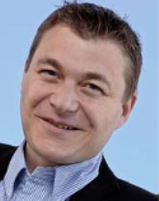 His operational expertise lies in corporate strategy along with cooperations and investor dialogue. Business Partner, 1975, Dipl. Ing. Engineering / process and environmental. 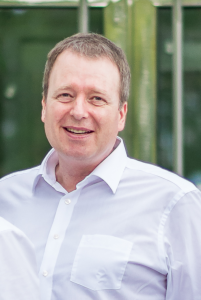 Managing Partner of a project and corporate development AG. Before that, founder and CEO of international engineering group with sales in 2013. Turnkey systems, development, industrial products and Service to 300 Employee. Business partner, 1972, graduate in business management. 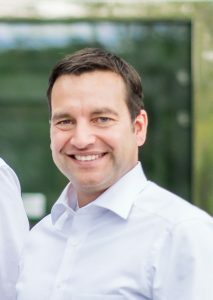 Managing director of High Tech Corporate Services GmbH, a service provider for the operational development of start-up companies in innovative sectors/technologies. More than 100 companies successfully consulted from start-up to exit. Prior to this, director and CFO of several technology companies. Founder of multiple companies, Business Angel. Pyrolytec is always looking for qualified specialists to strengthen its team. Please find the vacant positions to the right.